Newport, RI, October 2009 - Wimco Villas launched a vacation photo contest last summer inviting clients and their friends to submit photos from recent vacations. Over 2,000 vacation photos flowed in, featuring shots from family vacations taken that spanned the world, from St Barts to St Tropez, and from Tuscany to Hawaii. Wimco staffers chose the top 10 photos, then invited all their clients to cast votes for the winning photo. Some 1,027 voters went on line, selecting Haluk Emiroglu’s other-worldly, wet-hair-flipping mermaid, photographed in an oceanside pool in St. Barts, as the first prize. The photographer is from New York. Haluk and his good friend Denise are clients of Wimco Villas reservation agent Ellie Bettle, and they took the photo while on vacation earlier this year. 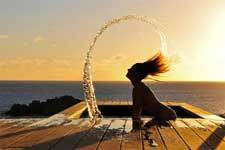 The picture was taken at Wimco’s Villa SIB GUS in St Barts and the woman in the pool is Denise. The winner received a complimentary week in Wimco’s Villa SIB VEL in St Barts and a free rental car from Welcome Car Rental on St. Barts. Second and third prizes went respectively to Tracey Morrell, capturing a family jumping into a pool together on Anguilla, and a silhouette of three brothers taken on Maui by Kyle Roe. Morrell will receive a three-night stay in a beautiful suite with private plunge pool at Hotel Carl Gustaf in St. Barts plus the rental car, one dinner for two and other extras. Roe will receive complimentary first night grocery provisioning the next time he travels with Wimco. The winners also received a $50 gift certificate to MyPublisher.com so they can create their own vacation photo book, travel guide books and beach bags. Photos submitted needed to be of destinations served by Wimco Villas: Caribbean islands, sun-splashed locales around the Mediterranean, Hawaii and Mexico. Wimco Villas is an award-winning luxury villa rental company, providing access to some of the world's most beautiful and exceptional private villas. In the Caribbean, Wimco represents over 270 villas on St Barts and offers an expansive selection of privately owned villas throughout the region including the US and British Virgin Islands, Turks & Caicos, Anguilla, Barbados, Mustique, Nevis, St Martin, Jamaica and Grand Cayman. In Europe, Wimco represents villas in Italy, the South of France, and Mykonos. Wimco recently introduced a selection of private villas in Maui and in Punta Mita, Mexico.